Precisely what remains of the Northern Zone enclosure layout west of Road 1 is difficult to determine by the Late Roman period (Figure 191). The major north-south boundary marked by ditch 25021 probably endures into Period 5, at least to the end of the 3rd century. 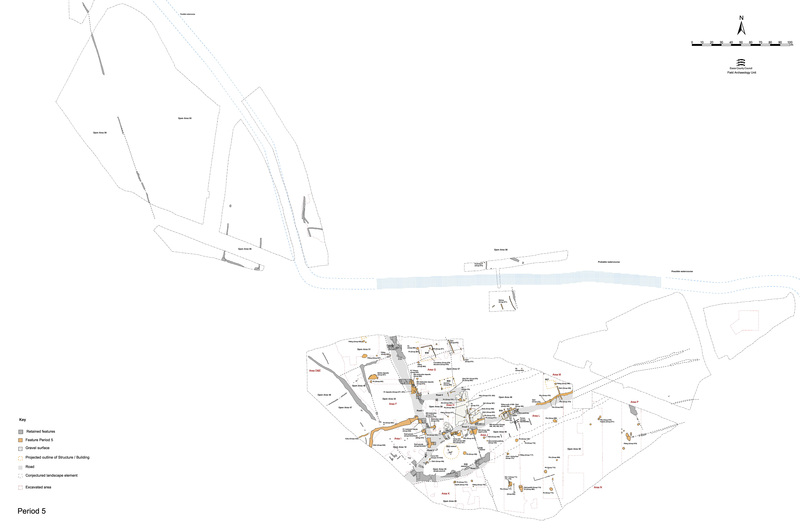 No other features encroach upon its line and there seems to be some continued deposition into its top in the 4th century, particularly at its southern end nearest the settlement core. 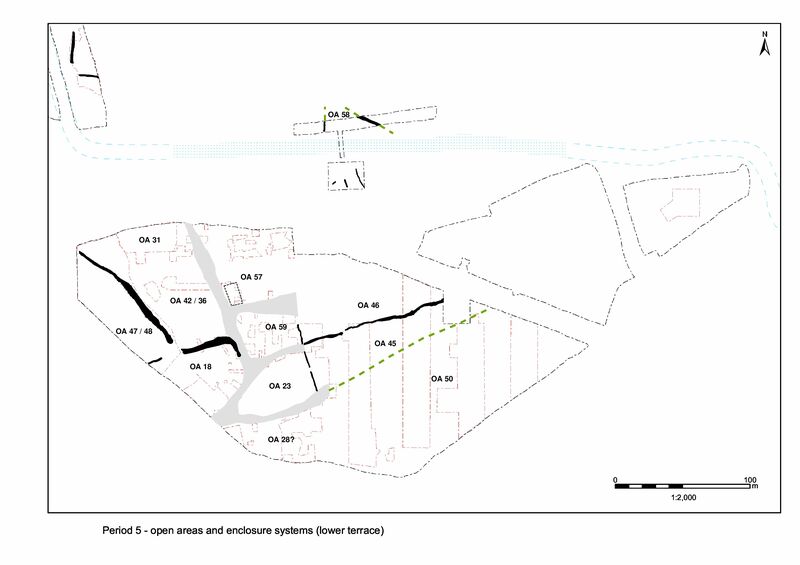 Similarly, the southern boundary also survives, with Period 4 ditch 25015 and fenceline Structure 42 being replaced by ditch 25027 and supplemented by ditch 25031). 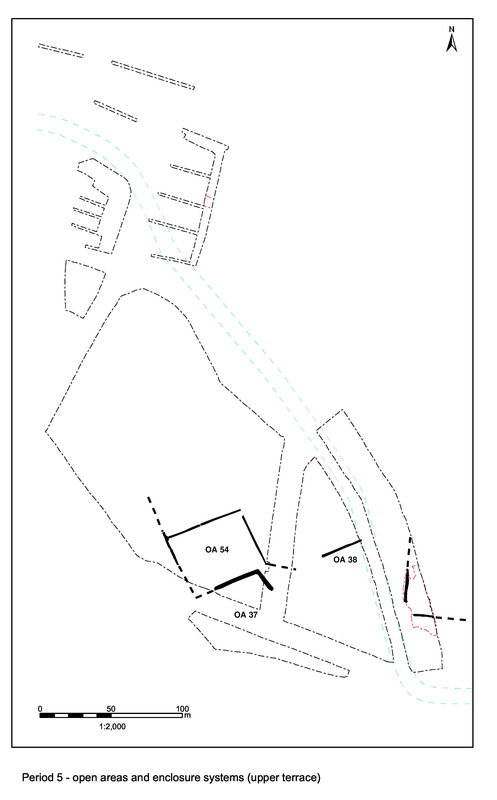 Subdivision within this basic structure is unclear and perhaps largely academic by this time. It seems unlikely that OAs 32 and 49 survive as separate entities, or indeed OAs 47 and 48. The remains within their interiors are therefore described together. However, OA31 may still persist as a meaningful land entity. Pits 8142 and 8155 (Group 836) lie close to the northern investigated limit of OA31. These are distinguished by virtue of the human remains within them (Figure 192). Pit 8155, a small rectangular cut (1.34 x 0.94m) contains an articulated human arm, along with other fragments of bone, from a middle-aged or older male. 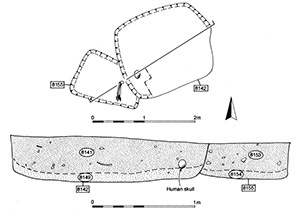 The mixture of articulated and disarticulated remains within 8155 and the absence of such items as finger bones (as noted at the time of excavation) suggests redeposition. Partially overlying and truncating this is 8142, a larger sub-square cut (1.9m x 1.5m and c. 0.44m deep), which contains an articulated skull with mandible still attached, also from a man of at least middle age. It is clearly possible that the skull comes from the same individual as the arm, although this cannot be determined with certainty. Apart from the presence of human remains, neither pit contains artefactual material that is particularly different from rubbish pits in the vicinity. Quantities of brick and tile are high, as is usual in late pits, although pottery content is markedly low. There is a concentration of iron nails and unidentified iron, which could perhaps suggest a wooden casket, but this can only be speculative. 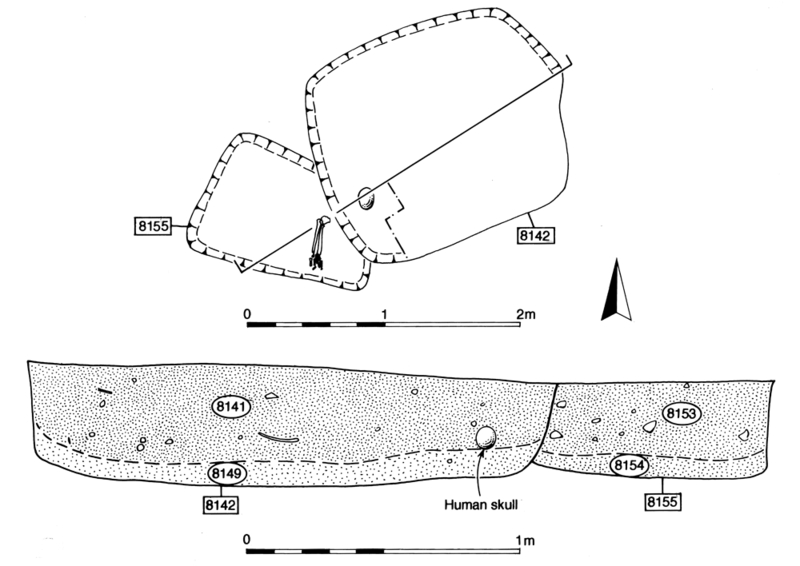 The presence of the human bone may therefore indicate the re-interment of one or two disturbed burials, relatively fresh at the time, rather than an in situ structured deposit. Pottery from the pit fills dates this activity to the late 3rd to early 4th centuries, although its high fragmentation may suggest that a late 4th or early 5th century date is equally possible, in which case these pits would be better placed in Period 6. Three further pits 10018, 10059, 10067 (Group 837) also lie within OA31. Pit 10059 is located close to the pits described above. Although its fill appears to be a typical Late Roman rubbish deposit, an association between them cannot be entirely dismissed. The remaining two pits are sited closer to the posited southern boundary of OA31. 10018 is a small circular 'cut' centrally positioned in the top of the fills of early Roman pit 10026 (Group 789 Period 3). Its single fill dates to the late 4th century AD and includes residual coins of the mid-2nd and late 3rd centuries. It is possible that this deposit is a gradual accumulation within the slump hollow of the earlier feature, rather than a cut pit in its own right. Pit 10067 is large and similar to those of the preceding period (e.g. 8080, 8114 and 10062) in terms of both dimension and artefact content. Indeed, 10062 continues to accumulate material in its top into the later 4th century AD. 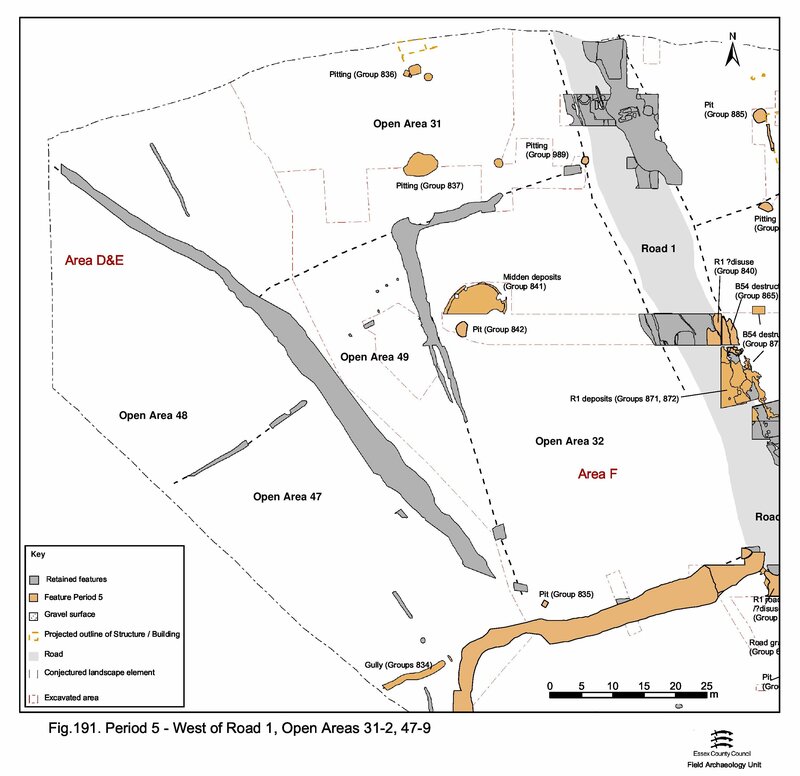 Small 1.1m-diameter pit 10504 (Group 989) is sited in the south-east corner of OA31, immediately west of Road 1. The finds from this pit comprise mainly pottery and tile, though there is also a significant metalwork component. Much of the infill dates to the earlier 4th century, with late 4th century material accumulating within its slump hollow. 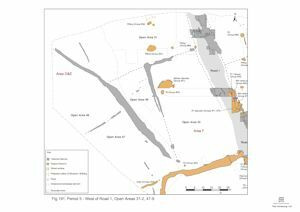 Pit 9651 (Group 835) is a small circular cut 0.86m diameter and 0.37m deep, located alongside the west end of southern boundary ditch 25027. Its finds are entirely unremarkable, comprising pottery, animal bone, tile and two iron nails. It dates to the first half of the 4th century AD. 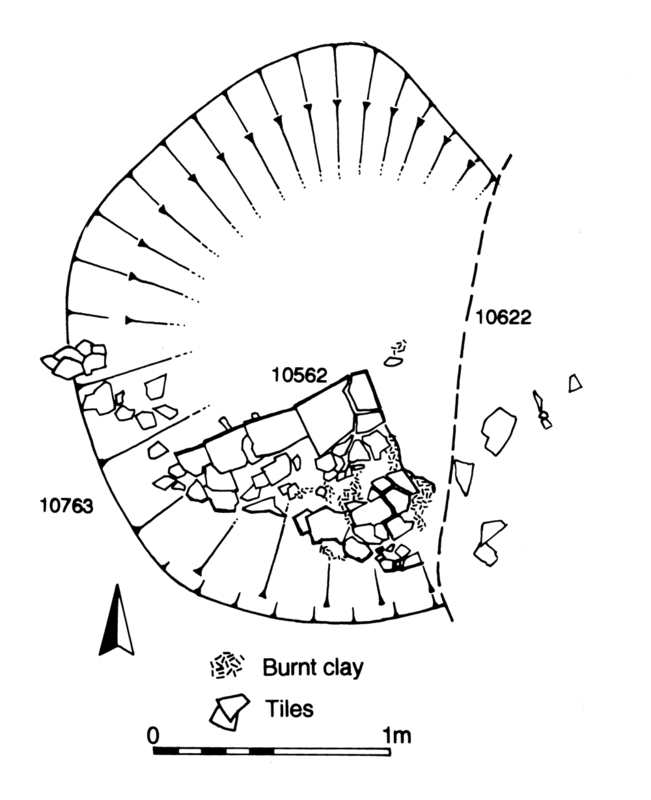 The fills of pit 10763 (Group 842) demonstrate an episode of initial deposition followed by dumped backfills into the remaining depth of the cut. 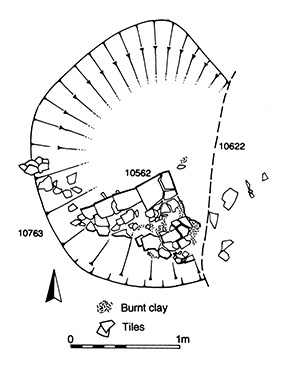 The backfills include a large fragment of the corner of a brick structure (Figure 193). This consists of seven courses of brick, bonded with clay. The origin of this bonded brickwork, which could derive from a building or an outlying structure such as an oven or drying floor, is unknown. The pit could be dug in the later 3rd century, but the backfills date to after AD 330 on the basis of the inclusion of coin SF5458. Its artefact assemblage is large and diverse, as is expected of a Late Roman pit at Heybridge, and includes an array of metalwork items. A 10m-diameter sequence of concentric circular deposits (10496, 10639, 10605, 10693 Group 841) is interpreted as a truncated dump or midden. Although all essentially dark silts, these vary in both colour and pebble content. The various deposits contain a diverse array of finds, including pottery, tile, quern, slag and particularly metalwork (mostly iron nails). Three 4th century coins are present, two of which are dated to AD 347-348 and so supply a later 4th century date for at least some of this dump or midden sequence. This 'feature' suggests that the nature of rubbish disposal may be changing in the later life of the settlement. It is possible that fewer pits are being dug for this purpose and that rubbish is instead being heaped in a midden. The almost total lack of late pits in this area naturally provides some support for this idea. This, of course, has implications for the nature and structure of the settlement itself, and its decline and fragmentation. No Late Roman remains are present within either OA47 or 48. It is likely that the land west of ditch 25021 is a single entity, presumably functioning as a paddock or cultivated field.